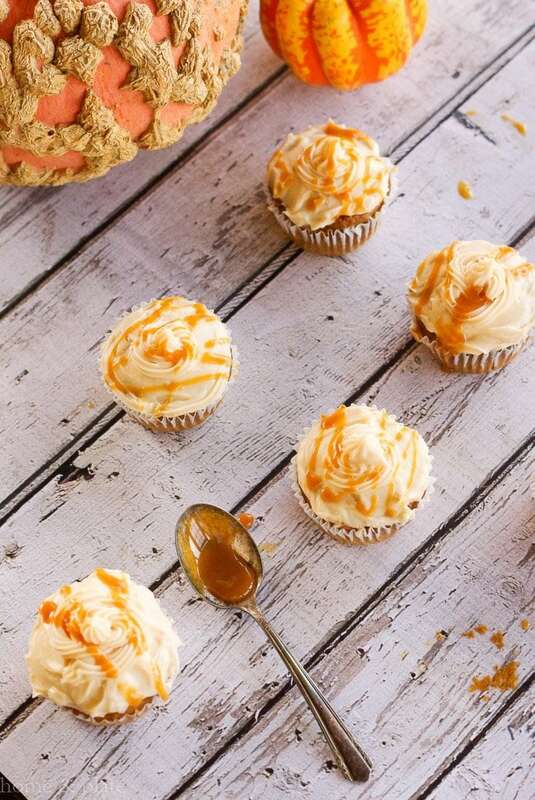 Fall in love with my Pumpkin Cupcakes with a salted caramel frosting – Sweet pumpkin. Salted caramel. Put the two together and you have heaven in a cupcake. Doesn’t this frosted cupcake look decadent? And the drizzle of salted caramel on top is just irresistible. I couldn’t keep my teenager out of the frosting. I crafted this recipe for all the #Foodiemamas out there. Today I’m joining in with other food bloggers who are rounding up their favorite pumpkin recipes. Be sure to check out all the wonderful recipes at the end of this post. 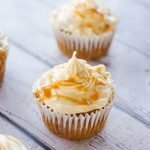 These Harvest Pumpkin Cupcakes with a Salted Caramel Frosting are easy to make and promises to appease palates of all ages. A box of spice cake mix and a jar of salted caramel topping makes this dessert simple to make in no time. The pumpkin spice cupcakes alone are healthy and Weight Watchers approved. Add the salted caramel frosting, and there’s something for everyone. Are you skipping sweets or counting calories? Looking for a healthy after school snack for the kids? Then skip the frosting and dive into these pumpkin cupcakes guilt free. Or, if you’re like me, add the salted caramel cream cheese frosting to the cupcakes for an elegant dessert or sweet treat. How would you like your cupcake? Be sure to SCROLL DOWN for more pumpkin recipes from a few fabulous #FoodieMamas. Enjoy all that these great #FoodieMamas Bloggers have to offer. 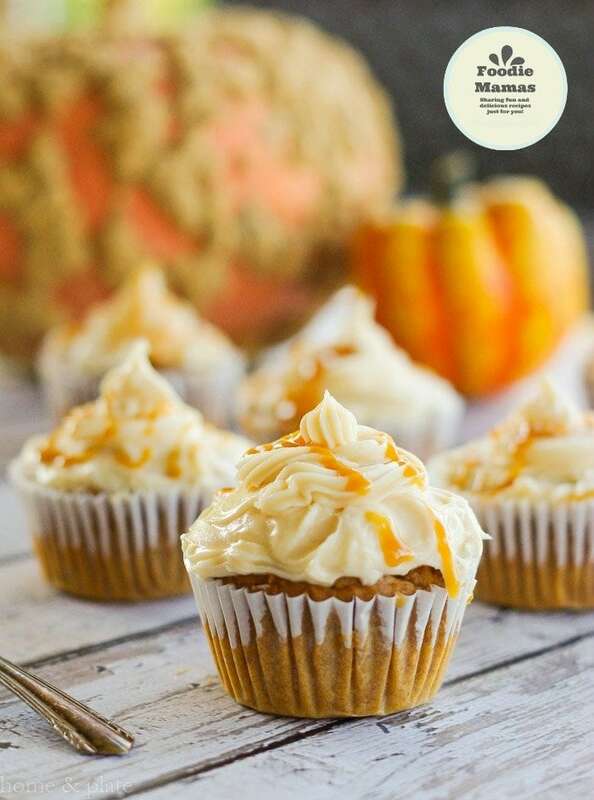 Fall in love with my Pumpkin Cupcakes with a salted caramel frosting - Sweet pumpkin. Salted caramel. Put the two together and you have heaven in a cupcake. Preheat the oven to 350°F. Add liners to your cupcake tins and spray each liner with a shot of cooking spray. Mix together the cake mix, pumpkin and water and blend well. Pour the batter into your cupcake tins about 2/3 full and cook according to the box directions, approximately 30 minutes, until a toothpick inserted comes out clean. Allow the cupcakes to cool completely. To make the frosting, beat together the cream cheese, butter, vanilla and salted caramel topping until fluffy. Add in the powdered sugar gradually until well blended. 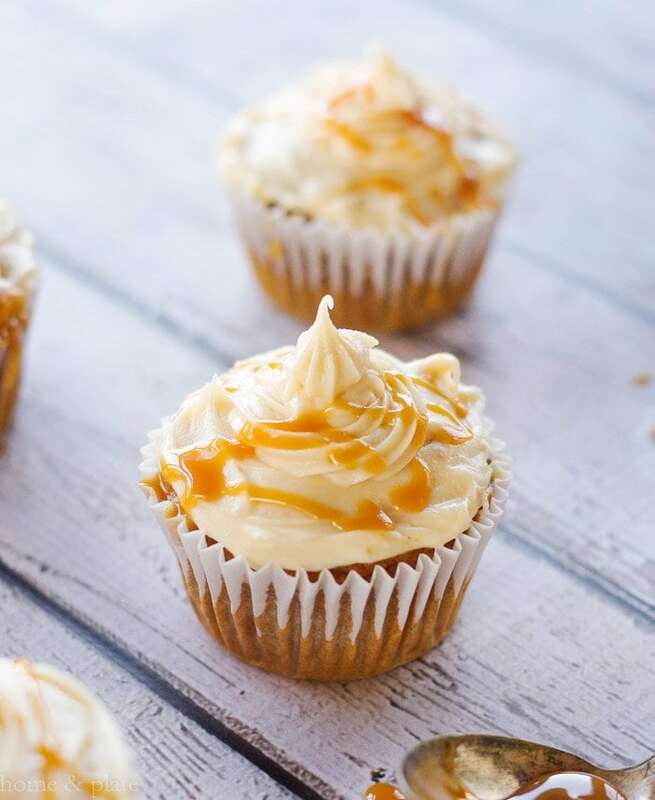 Frost the cupcakes then drizzle with a spoonful of salted caramel topping. Refrigerate any leftover cupcakes. Deepika from Easy Baby Meals knows comfort food. Her Pumpkin with Orzo Pasta is the perfect way to enjoy the flavors of fall. Chrissie from The Busy Baker makes dessert easy with this No-Bake Mason Jar Pumpkin Cheesecake. Couldn’t you just dive right in? Sara from Life’s Little Sweets shares her Pumpkin Spice Bread. This autumn classic promises to become a family favorite. Amanda from The Chunky Chef knows pumpkin is not just for Halloween. Get her recipe for homemade Pumpkin Risotto in Edible Parmesan Bowls. Emily from The Best Of This Life shares her Homemade Vegan Pumpkin Spice Latte…the perfect beverage to warm up when its cool outside. Kaitie from Fuchsia Freezer makes homemade Pumpkin Fudge that looks gourmet. Drizzle with your favorite sweet toppings. 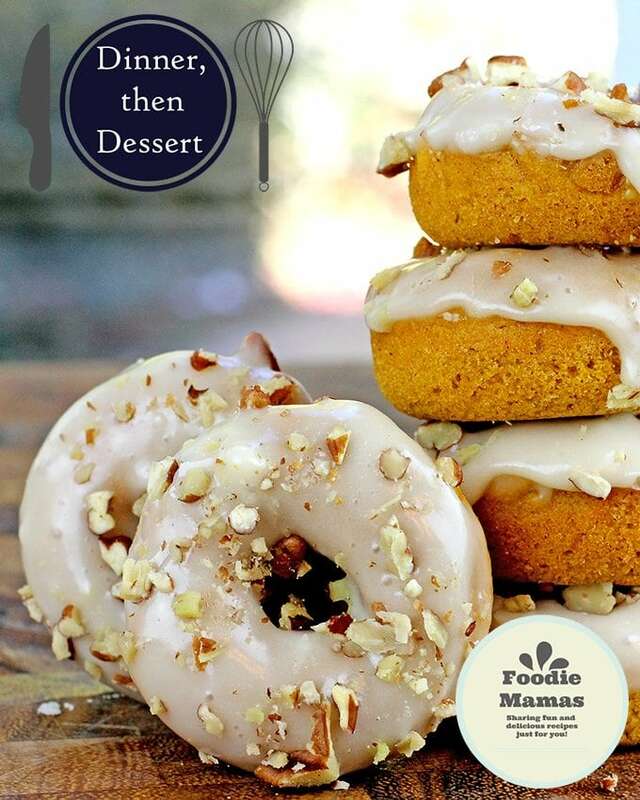 Sabrina from Dinner Then Dessert knows how to start the day off right with these delicious Baked Mini Pumpkin Pecan Donuts. Thanks Heather….I’m all about easy. Enjoy them. These look absolutely amazing 😀 Love the addition of salted caramel! Thanks Chrisy. Love the salted caramel so much more than just plain caramel. Thanks for the love. YUM! I don’t think there is a better flavor combo on the planet than pumpkin and caramel. These cupcakes look so indulgently and insanely delicious! I definitely have to try these. Pinning! I totally agree. Something about pumpkin and caramel. So Good! Everything about these cupcakes is screaming fall to me! So freakin’ gorgeous – for reals! Pinned! I’ll take two please. With extra frosting!! Coming right up. Thanks Brandon. Oh my Ali. This is serious temptation. I’ll take a baker’s dozen please. Salted Caramel frosting? YES YES YES!!! They were so decadent and tasty. You are right…serious temptation. I totally agree. I am finding lots of different ways to eat it up. Great on cookies. So pretty! 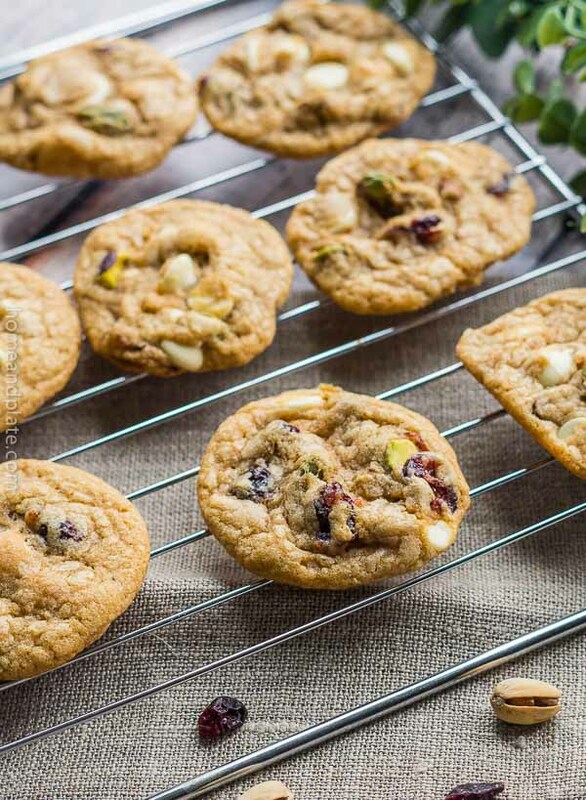 Love pumpkin everything, and these are sure to be a crowd pleaser. Thanks Susan. They were a crowd pleaser and did not last long. These cupcakes look so good. I love pumpkin, I can’t get enough of it! Thanks Kacey. I usually prefer my pumpkin in sweet ways like treats. The caramel adds the perfect flavor combo. Sara…I thought they would be great with the salty and sweet. They turned out to be a hit! Thanks. These look delicious Ali! Plus, they’re so darn pretty! Thanks Erin. It’s a great compliment coming from you. 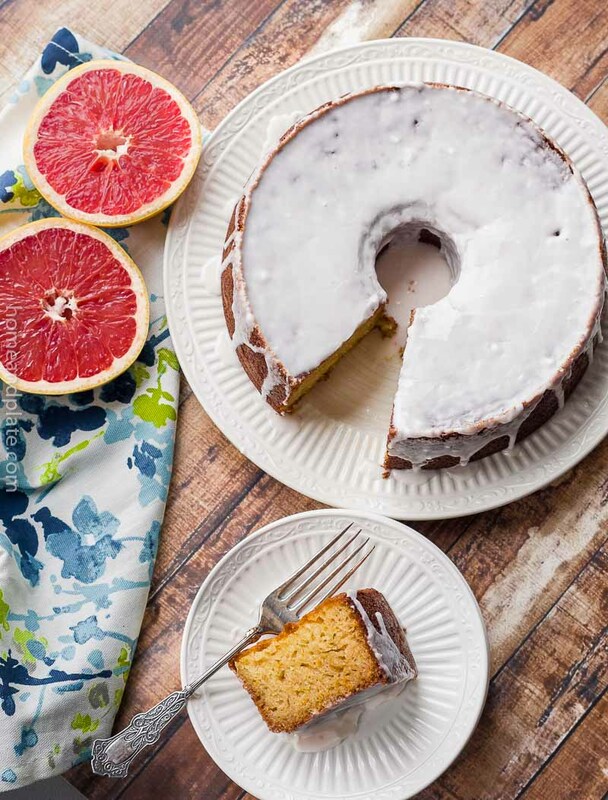 Gorgeous pictures and the recipe sounds delicious!! I am pinning this. That salted caramel frosting is to die for. Yum! Something about the salty and sweet. So good! Oh man these cupcakes look perfect! That frosting sounds so ahhhhhmazing! Ooooooh, these sound fantastic! Gorgeous cupcakes. I want to lick that spoon in one of your pictures! These look amazing, so glad to be in such talented company with you and the other #FoodieMamas!